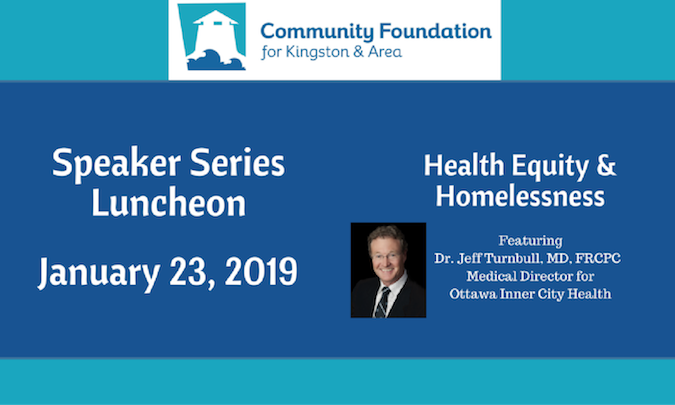 This Speaker Series Luncheon featuring Dr. Jeff Turnbull will pick up on the conversations started at our Vital Signs® launch on the topic of Health Equity & Homelessness. Dr. Turnbull, a specialist in internal medicine, stepped down from his role of Chief of Staff at The Ottawa Hospital to devote more time to his passion – working with Ottawa’s homeless. As the Medical Director for Ottawa Inner City Health, he is working to improve the health and access to health care for people who are chronically homeless. Dr. Turnbull was awarded the Order of Canada in 2007 for his work. We are thrilled that he has agreed to come to Kingston to describe his experience in engaging and empowering the community to support those facing homelessness, health and related challenges and to incite a discussion of its relevance to our community. Cost: Tickets $50.00 (includes lunch and a $25.00 charitable receipt). Click here to view Dr. Turnbull’s bio and for more information.